The last win for Rick Ankiel as a big-league starter was an unexpected gem. Years later, he revealed he did it while inebriated. After an erratic spring training performance (19 walks, 12 strikeouts in 9.1 exhibition innings), Ankiel was paired in his first start of the 2001 season against Diamondbacks ace Randy Johnson on April 8 at Phoenix. “Naturally, I have a little apprehension,” Cardinals pitching coach Dave Duncan told the St. Louis Post-Dispatch before the game. Ankiel had a terrific rookie season (11 wins, 194 strikeouts in 175 innings) as a starting pitcher for the 2000 Cardinals followed by a meltdown (9 wild pitches, 11 walks in four innings) in the postseason against the Braves and Mets. He entered the 2001 season with the same anxiety issues that plagued him in the 2000 postseason. Duncan had a secret plan. Rather than have Ankiel warm up in the bullpen that day, he instructed the skittish left-hander to throw in an indoor hitting tunnel at Bank One Ballpark. “I wanted him to get ready in as secluded an atmosphere as possible,” Duncan told Rick Hummel of the Post-Dispatch. An hour before Ankiel had to go onto the field, he asked teammate Darryl Kile to bring him a bottle of vodka, Ankiel said in his book. While his teammates were doing warmups on the field, Ankiel said he took “a few long pulls” from the vodka bottle while in the clubhouse. He said he poured the remainder of the booze into a water bottle and carried it into the dugout. The game had the potential to be a mismatch. Johnson was the reigning National League Cy Young Award winner. The Diamondbacks had a potent lineup. St. Louis was without two of its top players, ailing Mark McGwire and Jim Edmonds, and had utilitymen Eli Marrero at first base and Craig Paquette in left field. The game began ominously for Ankiel and the Cardinals. In the first inning, Matt Williams connected for a two-run home run off a low fastball from Ankiel. In the second, the Diamondbacks loaded the bases with one out. Two of those runners reached on walks. Ankiel escaped the jam when he struck out Tony Womack and Reggie Sanders. “I laughed at the absurdity of it and, while locked in a battle for my nerves, managed to have a good time playing baseball,” Ankiel said in his book. After the Cardinals scored four off Johnson in the third, Ankiel protected the lead by retiring the next nine batters in a row. When Ankiel walked Luis Gonzalez, the leadoff batter in the sixth, with his 100th pitch, manager Tony La Russa lifted him for Gene Stechschulte, with St. Louis ahead, 9-2. “Electric stuff,” La Russa said of Ankiel’s pitches. It was Ankiel’s last major-league win as a starter. He made five more starts for the 2001 Cardinals and mostly reverted to his wild and ineffective form of the 2000 postseason. 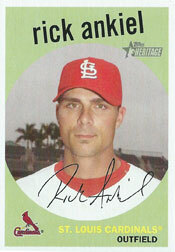 Ankiel finished 1-2 with a 7.50 ERA for the 2001 Cardinals. His last pitching performances were five relief appearances, with a win, for the 2004 Cardinals before he converted fulltime to outfielder. I believe I have this game taped on VHS (so absolutely no way to actually watch it). The Pujols double, off of Johnson on a tough pitch, was when I started to believe this kid was special. Thanks for sharing those insights. I wish MLB and the Cardinals would make such landmark games available on video.